Adansonia gregorii. 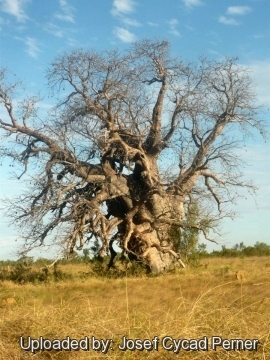 Boab in the Weaber plains near Kununurra in the East Kimberley Region of Western Australia. Origin and Habitat: Australia. 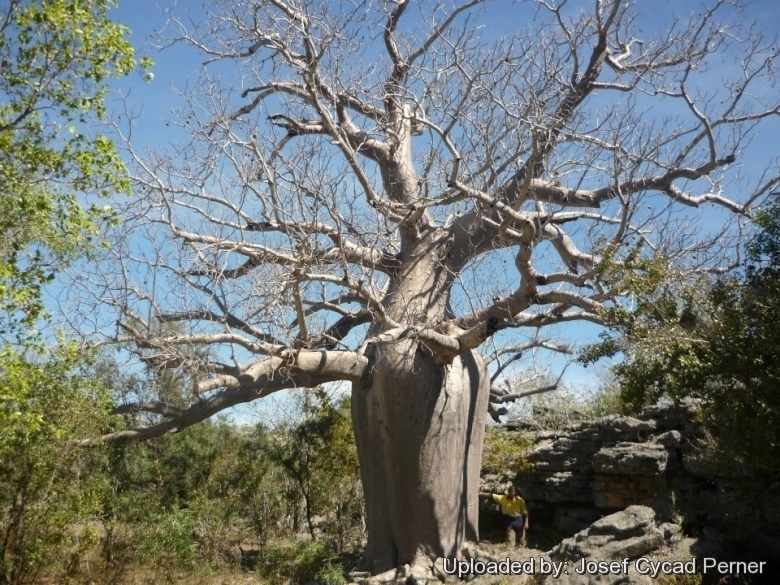 Adansonia gregorii is indigenous only to the Kimberley and the Victoria River basin at the western edge of the Northern Territory, which is its eastern boundary. Its western limit, Baum writes, 'is roughly at the boundary between the shires of Broome and Derby, 100 kilometres east of Broome'. 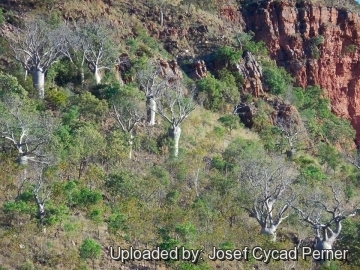 Altitudinal range: Near sea level to 400 m.
Habitat: Adansonia gregorii occurs on a wide-range of soils comprising light textured soils derived from sand-stone and basalt, but also on rocky outcrops and on limestone hills. It grows in open woodlands where individual trees are usually spaced widely apart. Occasionally small thickets of A. gregorii occur and these are usually the result of regeneration from one or more parent trees. In addition, it is occasionally distributed along creek lines. Climate: Hottest/ coldest months: 35-39°C/13-18°C. Frost incidence: low. Rainfall: 500-1500 mm per year, mainly in summer, however, it can tolerate a fairly wide range of conditions, provided it has good drainage and is not subject to hard frost. Adansonia gregorii are often subject to periodical fires. They survive to fire and establish new canopy from preexisting meristems. The baobab are more fire tolerant than understory species. Fire opens understory, promotes seedling establishment, and enhances the subsurface water supply, reducing competition for water. The pollinators are most likely to be moth species of the Sphingidae family. Adansonia gregorii f. globosa Ostenf. 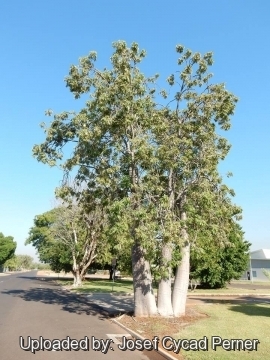 Description: The Boab Baobab or Bottle Tree (Adansonia gregorii) is a medium sized deciduous tree species with spectacularly large, swollen trumks, digitate leaves and pendulous velvety gourd-like fruit. 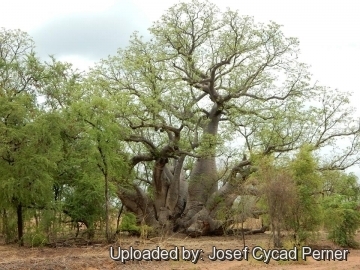 It is closely related to the African Baobab (Adansonia digitata), but much smaller (5-12 m in height or more) and with erect flowers. Older trees forms an umbrella-shaped and sparse campy. Large trees are believed to be of great age. Stem: Trunk with large swollen base, barrel- to bottle-shaped and up to 15.7 m in circumference. Bark smooth, somewhat shiny, often pock-marked especially on very old trees, dull grey. Wood soft and porous, spongy, somewhat fibrous. Leaves: Juvenile and adult leaves alternate, petiolate, palmate to 7-11 cm long, petioles to 9 cm terete and slightly swollen at bases. Leaflets 5 - 7 (-9), sessile to shortly petiolate (petiolules 1-3 mm), elliptic, 6-12.5 long x 2.5-5 cm wide, glabrous, margins entire. Bright green above and dull beneath, nervation highly reticulate, midrib raised beneath. Trees are deciduous during the dry winter period and the new leaf, produced in late spring and early summer, forms an attractive light green canopy of finger-like leaves. Flowers: Terminal, solitary, erect, white, slightly shented, 1.5-4.5 cm long appearing while the species is in leaf but the trees are often leafless when in fruit. Floral buds about 8 x 2 cm with 5 fused, brown-furry. Sepals lorate-obovate, 10-12 mm long and wide, splinting and curling backwards towards base of flower in 4-5 segments at anthesis. Petals white, waxy, narrowly obovate, 13.5 - 15 x 1.5 - 2.5 cm. Stamens numerous (greater than 50), fused in a tube 2 cm long, free tips 4.5 - 5 cm long. Ovary, 5- to 10-locular. Style longer than the stamens, white, tipped with a spherical stigma that has small splits at the top. Blooming season ( in habitat): November-December. Seeds: Dark brown to black, bean-like, 1-1.5 x 0.5-1 cm enclosed in a powdery mass. Chromosome number: 2n = 88. 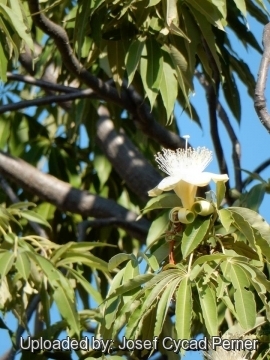 7) David A. Baum, “The Comparative Pollination and Floral Biology of Baobabs (Adansonia- Bombacaceae)” in Annals of the Missouri Botanical Garden, Vol. 82, No. 2 (1995), pp. 322-348. Cultivation and Propagation: Adansonia gregorii are quite easily grown from seed although they are seldom available in nurseries. Grow in good light, don't over-water and provide a minimum winter temperature of 5-13° C as they cannot tolerate frost. 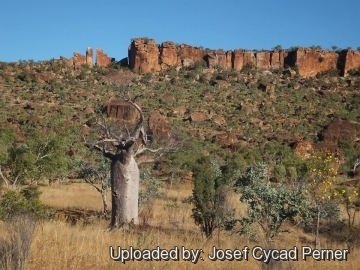 Despite its adaptations to dry climates, baobab will thrive in rainy climates provided it has a well drained soil provided they are frost free and don't experience cold winters. Saplings can be effectively grown in containers for many years before becoming too large and requiring to be planted into the ground. In this manner one can move them out of the cold into a warm position in a glasshouse or indoors behind a sunny window to prevent frost damage. It can be also trained as a bonsai tree. 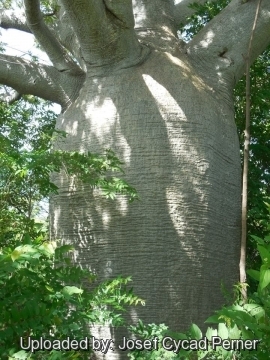 Watering: Baobab is very drought tolerant, and needs no water at all during the winter. Uses: The plant has a wide variety of uses; most parts are edible and it is the source of a number of materials. 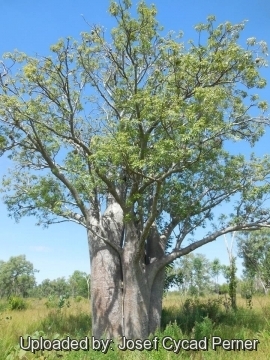 Aboriginal people obtain water trapped in deep hollows inside large trees, or by chewing the roots. A white powder which fills the seed pods and surrounds the seeds can be made into a kind of bread or used to make a drink, or eaten dry. Decorative paintings or carvings were sometimes made on the outer surface of the fruit. The leaves were used medicinally. Reproduction: The seeds should be soaked in a container of hot water and allowed to cool, they may then be sown after soaking for 24 hrs. To break dormancy, the seeds require a high moisture content between 80% and 90% field capacity. Sow in trays, pots, etc o in a well-drained seedling mixture containing one-third sand in a propagator or warm place with a minimum of 25°C to a soil depth of 5cm. The optimum temperature required is 27°C, with 30°C for maximum germination and plant growth. Seeds are best sown in spring and summer . Germination may take from two to six weeks. Baobabs grow reasonably quickly when they are young. It also can be started from cuttings.